Tips, tricks, and hidden items abound in Suikoden. This is a list of the ones of which we are aware. Check the armor across from Kraze's office for 100 bits at the start of the game. After the audience with the Emperor, don't go home. Instead, go to Sarady and talk to the man in the upper-right house. You'll get a Fortune Rune. Alternately, go home and as soon as Ted joins the party, go to Sarady and talk to the man in the upper-right house. You'll get a Prosperity Rune. 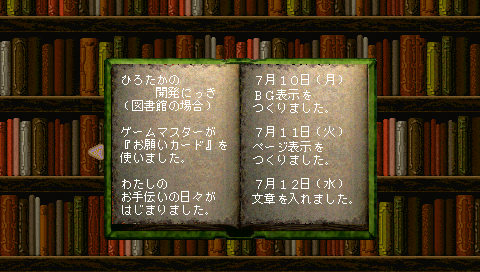 In the Japanese version, once you've collected all 8 Old Books you can highlight the 8th volume and press square, circle, triangle and X at the same time to bring up a secret 9th volume. Assumingly Hirotaka refers to producer Hirotaka Ishikawa. For whatever reason this was removed from the PAL version, most likely from the US version as well then as they're pretty much the same. This was confirmed to work on the PSP I & II version but it should be the exact same as the original PS version. Fight an optional battle with Empire soldiers in Rockland after the Mt. Seifu mission for an extra scene. Try to leave Kraze's mansion without talking to Pahn. Accept to kill Kwanda at the first option for an extra scene involving Windy. Accept to kill Milich at the first option for an extra scene involving Camille. Try to enter Kaku by boat, after the first battle with Teo. When you return from Kirov with the fire spears, enter the castle by boat. After being denied entrance to the Dragons Den, enter Antei with less than 200 bits and speak with Vincent. Take Liukan with you, on your first conversation with Joshua. Return to the old liberation army's hideout the time you can re-enter Gregminster area. Enter the lower left house in Lenankamp with Meg in your party. Talk to the guy on the second floor of the inn at Lenankamp with Krin in your party. Check on a tombstone in Rockland with Clive in your party. Talk to Kasim and Kraze right before your audience with the Emperor. Visit Sonya right after Teo leaves the house for the first time. In Gregminster at the start of the game, if you talk to the shopkeeper in the hardware store with Gremio in the party, the shopkeeper will ask Gremio how the banquet was and will say that he will settle Gremio's tab after you get back. It's a cute little setup for Camille. The shopkeeper will only say this if you come to see him before going to see Kraze your first morning working for the Imperial Guard. Check on the diaries of Pahn, Cleo (looked), Sonya and your own (save point). Speak to Futch at the barn before meeting Kraze. Black (Futch's Dragon) reacts differently depending from which side you are talking to him,when he is waiting in the barn along with Futch. Also sometimes if you talk to him from the behind he'll make a little crouch. When you enter to Marie's inn during the time you work under Kraze you'll find 5 soldiers fighting about who is the best General. The guy who admires Teo will give you an extra comment if you talk to him first every time you enter the inn. Talk to Kraze over and over again (up to six times), after receiving instructions for the Rockland mission. The woman who runs the armoury in Rockland gives a different dialogue if you approach her behind the counter. Talk to two men in Rocklands inn with Kanaan in convoy. Take the captured bandits with you to Kraze instead of Grady for some additional lines. Krin can be found in the upper left house in Lenankamp at the beginning. Talk to Onil often, for different hints and comments throughout the whole game. Leave Kouan, the night Krin is waiting for you outside of Lepan'ts mansion, re-enter and talk to him at the inn. Also, you can get another comment if you back out of sneaking into Lepant's mansion (from the roof) after Krin sets you up to go in. Talk to Jeane, Lotte, Qlon, Sarah, Zen and Morgan with a level 2 castle, for some quotes you may have never seen before (keep your recruits to a minimum). If you talk to the hardware store owner in Rikon from the side instead of across the table, he has a special comment instead of opening the shopping menu. Talk to Anji at Pirate's Island with either just Tai Ho or just Yam Koo in your party. Talk to a guy in Warrior's village with Flik in your party. Check on Chandler's and Chapman's goods at your castle, if you have never visited any item and armor store at all. Check on the water of the Hidden rune village after Windy's attack. Rest at one of the coffins at Neclord's castle. Wondering why Krin and Stallion are always one step ahead? Because they have those special Escape talismans, that grants them unlimited use. Towards the beginning of the game, go to Rockland. Save your game at the inn, and play Marco's cup game. Write down the position of the coin for several turns, then reset the game. Marco will use the same pattern, so you can gain a lot of easy money in the very beginning of the game. If he doesn't use the same pattern, simply reset and try again. Note that this trick only works when you meet him in Rockland.